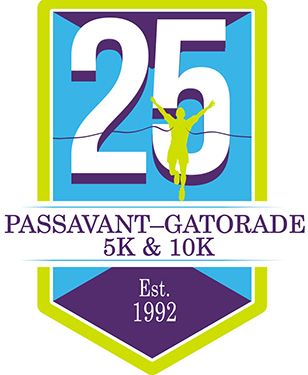 The 25th annual Passavant-Gatorade 5K and 10K is Saturday, May 27, 7:30 a.m., beginning in the east parking lot on the Passavant Area Hospital campus. Runners and walkers are welcome to participate. Proceeds from the race will benefit the Jacksonville Saints Special Olympics team. Both courses start and finish on Founder’s Lane on the east side of the Passavant campus. The courses are both considered flat and fast, and travel through mostly residential areas on Jacksonville’s west side. Course maps are available on the Passavant-Gatorade Race page on passavanthospital.com. Both courses are certified by USA Track and Field. The first 400 participants to cross the finish line will receive a special 25th anniversary finisher’s medal. Custom award certificates are presented to the top overall male and female finisher in each race and to first, second and third place, male and female, in 14 age categories. Post-race refreshments will be available and there will be prize drawings. May 25, 5:30 to 7 p.m. at the Springfield Running Center. Packet pickup for Jacksonville area runners is Friday, May 26, from 11:30 a.m. to 1 p.m. and from 5:30 to 7 p.m. Registrations are also accepted at packet pickup. Passavant’s Team Rehab will provide sports medicine coverage for the race. The 2017 Passavant-Gatorade Race is sponsored by Passavant: Gatorade: MJ Kellner: O’Shea Builders: Springfield Clinic Orthopedic Group – Darr Leutz, MD: Jacksonville Savings Bank: Central Illinois Community Blood Center: The Farmers State Bank and Trust Company: Air Evac Lifeteam #27: The Source: The Cubby Hole: HSHS Medical Group – Foot and Ankle Associates: Production Press: Pro-Com Services: CPI: The Medicine Shoppe: Financial Resources Group: Jacksonville Area Visitors and Convention Bureau: Fitness World: David Large Professional Painting and Evan Lloyd Architects.